#0151 Rare 'directoire' and 'temps decimal revolutionnaire' A decorative, remarkable Directoire pendule with revolution decimal time 1-10 and normal time 1-12. 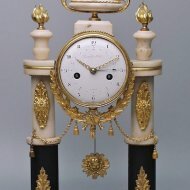 Case: white and black marble and gilt bronze, portal-shaped, rectangular, white marble base with rounded corners, three firegilt feet, gilt flower applications, white and black marble half-columns with applied acanthus, crowned by 2 vases, the clock movement in the centre decorated by a festoon and a cord, crowned by a vase with rose decoration, firegilt, glazed, ornamented brass bezel. 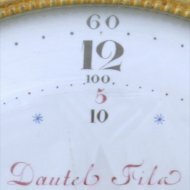 Dial: enamel, outer Arabic hours "1-12", inner Arabic hours "1-10", inner Arabic minutes "25-100", firegilt, pierced hands, blued arrow-shaped hand for decimal hours, signed. Movm. 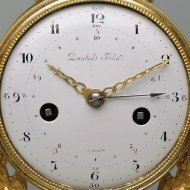 : brass full plate movement, 1 hammer/1 bell, 2 barrels, locking plate, half hour/hour self strike,anchor escapement, silk string suspension, Louis XVI-sun-pendulum, 15-days duration. Claude Aimé François Dautel, 1765-1800, workshop: rue de Buci à Paris.